Rising number of Chinese tourists and ensuing pressure from local governments puts heavy pressure on Taiwan’s Aborigines. For a relatively small country, Taiwan is blessed with no less than 14 recognized Aboriginal tribes, whose existence greatly enriches the ethnic and cultural fabric of its society. According to recent scientific research, it is now believed that Taiwan was the birthplace of all Polynesian Aborigines, thus placing its indigenous population at the center of peoples who have spread out to every corner of Asia. Though by no means perfect, the Taiwan model nevertheless provides the world with several lessons on how to make the center and the peripheries, where most of its Aborigines live, work. Now that precarious balance is under threat, and the growing influence of China within Taiwan is to blame. More and more, as Chinese tourists, investors, and officials penetrate Taiwanese society following the thawing of ties across the Taiwan Strait initiated in 2008, the island’s most vulnerable societies have had to adjust to an influx of people, money, and influence, a challenge of “modernity” the likes of which they had not encountered since the Chinese Nationalist Party (KMT) fled to Taiwan in 1949, or perhaps even since the arrival of the Japanese toward the end of the 19th century. In some cases, the challenge has not been overly different from previous phases of “modernization,” or from that of other Aborigine communities worldwide, which are confronted with the trauma of displacement as “civilization” encroaches upon their ancestral lands. In that respect, Taiwanese themselves have been guilty of stealing from, sidelining, and treating as mere inconveniences peoples whose way of life does not dovetail with our fast-paced “modernity” (not to mention dumping nuclear waste on their land, as on Orchid Island). Nonetheless, it is evident that the China factor has compounded the problem. Millions of Chinese tourists now visit Taiwan annually, thus accelerating the pace of evictions and encroachment upon ancestral land as hotels and various resorts are built to accommodate them. In other cases, Aboriginal villages are transformed into tourist attractions, often without the consent of the residents but with great pressure from developers, officials, and legislators who stand to enrich themselves by catering to the Chinese. A single example suffices to show the extent of the problem. 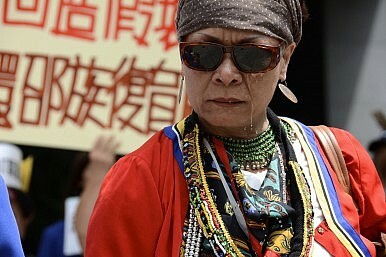 In September 2013, Thao Aborigines — Taiwan’s smallest tribe, with fewer than 700 members left — gathered in front of the Environmental Protection Administration (EPA) in Taipei to protest against a “build-operate-transfer,” or BOT, project to build a 300-room hotel on their land near Sun-Moon Lake, a popular scenic spot in central Taiwan. The hotel was planned to accommodate Chinese tourists who could not afford to spend the night at the four- and five-star hotels that now cincture the once-pristine lake, a favorite of former president Chiang Kai-shek. Besides the theft of land, Chinese tourists are now threatening to intrude on the festivals and sacred practices of the Taiwanese tribes. Never mind the “Aborigines,” wearing the wrong apparel and boasting never-seen feather arrangements, who for years have been paraded to entertain visiting dignitaries, most recently during the visit by Taiwan Affairs Office chief Zhang Zhijun in June this year (to be fair, such things also occurred under Japanese rule). Far more troubling is the transformation of communities, villages, and rituals into mere touristic commodities. Such intrusions, though not necessarily new, are certainly becoming much more frequent. The trend has caused consternation among Aborigines, who once again were not consulted by the central government and who fear that they are being used as mere pawns in the politico-economic honeymoon that has developed between local governments and the Chinese authorities. Such has been the anger that in July this year, a group of Aborigines turned the tables on the Tourism Bureau and “toured” its headquarters in Taipei as if it were a tourist attraction. The problem is at its most serious and alarming in Hualien County, whose commissioner, Fu Kun-chi (known locally as the “King of Hualien”), has made little secret of his intentions to ingratiate himself with Chinese officials and investors, besides repeatedly showing great disrespect for Aborigines in his county. Fata’an and Tafalong are the oldest niyaro’ (villages) of the Amis tribe in Hualien, known as the “capital of the Amis.” These niyaro’ are now facing what some members are describing as a serious threat. Under government pressure, their members have been asked to perform a dance during the first evening of the Ilisin (or “yearly offering,” though the ritual involves other social functions) in the company of minority groups from China’s Guangxi Province. Ilisin is the most important ritual (lisin means ritual; Ilisin means to be “at ritual”), in which only members of the specific niyaro’ can participate; the ceremonies pay homage to Malataw, the highest god, and their ancestors. On some occasions, allied niyaro’ will pay a visit on the first day of the Ilisin (known as palafang), where they will be treated as guests. However, no other people are allowed in. According to Dr. Scott Simon, a specialist in the political anthropology of indigeneity and development in the Austronesian communities of Taiwan at the University of Ottawa in Canada, the move in Hualien could be “a violation of Taiwan’s own Basic Act on Indigenous Peoples and the spirit of indigenous inherent sovereignty.” Under customary international law, the Aboriginal community itself should decide, through a decision-making process, whether to allow outsiders to participate in their ceremonies, he said, adding that the Amis have a “complete structure” to arrive at such decisions. However, a source within the Amis community in Hualien contacted for this article said the whole affair was arranged by Fu himself, adding that the Fata’an and Tafalong communities were divided and unsure of how to deal with the “visit.” Although younger tribe members want to chase the Chinese away, the elders “do not really know what these people represent and want to treat them well because they, with a kind of naiveté, regard such performances as ‘cultural exchanges,’” she said. A small group, known as the Fa-Ta Alliance for Attack and Defense (馬太攻守聯盟), with members from both the Fata’an and Tafalong, has been formed to deal with the crisis. The group says it intends to hold protests during the performances by the Chinese minorities (the Fata’an Ilisin will be held from August 14 through 16, and the Tafalongs’ from August 15 through 17). The pressure may not have been in vain. The Fata’an have since announced that they will not allow the Chinese groups to perform during their Ilisin. The challenge for young Aborigines is all the more daunting as the Chinese authorities have for more than a decade now treated elders to all-expenses-paid trips to China, in a tactic that is all-too reminiscent of Beijing’s treatment of another “minority” group in Taiwan — retired military generals. While the China factor in itself is not entirely new, the depth and scope of its contact with Aborigine communities across Taiwan, who account for about 2 percent of the island’s total population, is unprecedented. Its impact on the delicate balance between the central and peripheral regions remains to be seen, though it is likely that vested interests and new pathways for influence will complicate the problem.